Wing Chun: As Legend goes, the Shaolin elders pooled together their best technique to produce a "super art" that would develop high level fighters in less time than the standard Shaolin training regimen. But it was a nun, Ng Mui, who perfected the art, and passed it on to her female disciple, Yim Wing Chun, for whom the style is named. It is a highly aggressive art, with the emphasis placed on speed and in-fighting, coupled with highly mobile footwork. Blocks and strikes are delivered simultaneously, thus economizing motion and reaction time to a minimum. Wing Chun practitioners use a unique training technique called "chi sao" or "sticky hand", which develops the tactile sensitivity of the stylist's hands and arms, and allows them to "feel" their opponent's intentions, thus countering attacks before they are launched. 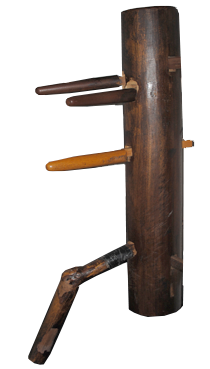 Techniques are further enhanced on an apparatus know as the Mook Yan Jong (wooden man ). Blows are delivered at close range, sometimes no more than an inch from the opponent's body, and are almost always aimed at a vulnerable nerve center. Each style has it's own corresponding weapons "sets" or "forms". From the crescent monk spade to the kwan do to the traditional broadsword, you can learn it at Ling Nam Siu Lum- from a Sifu with 30 years of experience. 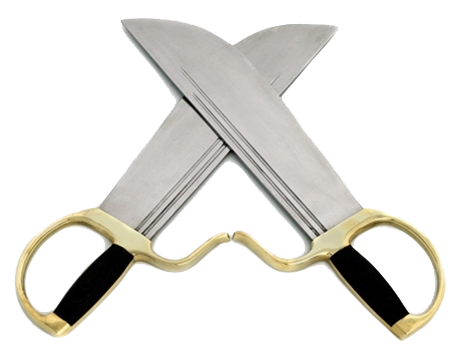 The first weapon you will learn will be the traditional broadsword, and no it won't be the one with the metal blade! It will be dull wood to save you and those around you from bodily harm. All martial arts- when practiced with proper technique, take time to master. Weapons require time, practice and a high level of concentration; the absence of either of the last two components usually results in unintentional injury. That's why you will not touch the metal weapons on the wall for quite some time!